This is another example of making something out of whatever is available. 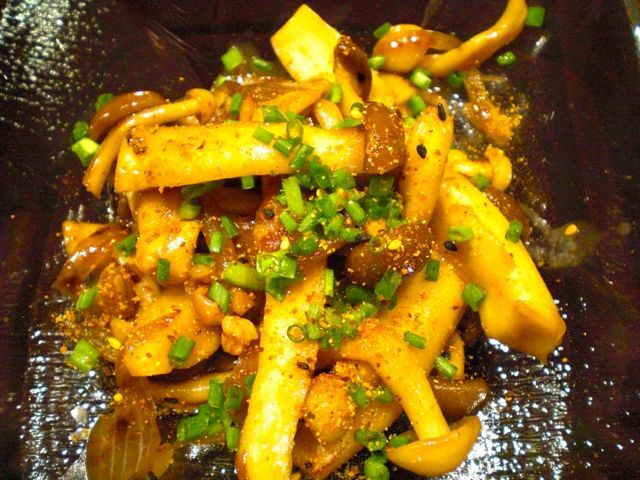 I made a stir fry of three mushrooms and added squid “shiokara” 塩辛 or “squid and guts” to add interest. I had a combo package of three mushrooms which included white and brown clamshell (shimeji しめじ) and royal trumpet (simialr to eryngii エリンギ) as seen in the bottom picture (#1). I bought this at least one week ago and needed to use it quickly. Although these mushrooms, especially royal trumpet, will last a long time, aging does not improve the flavor. In addtion, I found a small pouch of “shiokara” or fermented squid and guts leftover in the refrigerator, which was thawed sometime ago. I checked it and it was still Ok but moving past its prime. So, the combination of these two ingredients culminated in this quick dish. Mushrooms: I separated the white and brown clamshell mushrooms at the root end (left half in #1). I cut into the end of the royal trumpet and tore it into two or four pieces depending on the size the mushroom. (#2). I first sautéed a shallot (one medium, thinly sliced) in olive oil and dark sesame oil (1 tbs) on medium high flame for s few minutes until soft and slightly browned. I then added the mushrooms. After an additional few minutes of sautéing, I added garlic (one small clove, finely chopped). When the garlic became fragrant I added sake (1 tbs) mirin (1 tbs), and soy sauce (1/2 tbs) and put on a tight-fitting lid and turned down the flame to let it steam for several minutes. After the liquid was almost all gone (#3), I added “shiokara” squid and guts (2 tsp) and quickly mixed in then cut the flame (#3). After cooking, the volume of the mushrooms reduced quite a bit and the amount was just perfect for two small servings (#4). I further garnished it with chopped chives and sprinkles of Japanese 7 favored red pepper powder or Shichi-mi tougarashi 七味唐辛子. This was a good dish for cold sake but, to me, it was too sweet (from the mirin and sautéed shallot). The addition of shiokara gave some saltiness and subtle and interesting sea food (or “fishy” if you prefer) flavor. I am not sure adding shiokara was particularly successful. Next time, I may stick to more simple butter and soy sauce with sake to make this dish.